Is this the final word in Tube geekery? 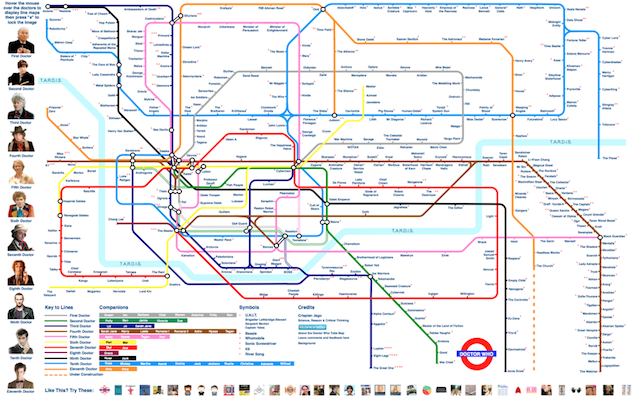 Crispian Jago, who describes himself as a 'godless Cornish git' has put together this trans-generational map of Doctor Who, based on the London Underground diagram. Each coloured line represents one incarnation of the Doctor. For example, Tom Baker's era is mapped out in Bakerloo brown, while Paul McGann's brief tenure is represented by a runtish mauve line. Each station corresponds to a baddie encountered by the Doctor. This leads to cluttered interchanges at stops such as Daleks and The Master with cleaner interchanges at Ood, Silurians and Weeping Angels. As if this were not enough, each Doctor's companions are also listed chronologically, and footnote symbols denote assistance from the likes of U.N.I.T. and River Song. Finally, every entry on the map is clickable, leading off to a wiki page about the adversary. Truly staggering stuff. See our guide to Alternative Tube Maps.